When coming up with the game design for Battle Brothers we instantly knew that the tactical combat will need a huge amount of attention. The tactical combat is where you put your tactics, your equipment and of course your battle hardened Brothers to the test. This core part of the game always has to be fun, and not a tedious chore you have to chew threw in order to progress in the game. With this in mind we set some basic rules, or “mantras”, for the tactical combat design. I think these mantras can apply to many games and should, in some form or another, always be on your mind when designing your combat system. Is the combat system repetitive? Are there always similar enemies, similar surroundings and similar tactics? To avoid this we took a couple of measures. First of all, the combat maps are completely procedurally generated. No two maps will ever feel the same, look the same or play the same (mind that procedural generation poses some challenges to designers and programmers, maybe we cover that issue in a later article). Secondly, there is a wide variety of terrain types like grassland, dense forest, swamps, roads and so on. Each terrain has different aspects to it like hindering sight, movement or combat abilities, that make fighting on it feel different. In the same vein, we have different height levels, and positioning on these means advantages and disadvantages when engaging an enemy on a different height level. Finally, there is a large variety of enemies each with unique skills, AI and combat behaviour. These three factors interlock and multiply each other allowing for nearly unlimited combinations of map, terrain and enemies that the player has to adapt to without being able to use a single dominant strategy that fits every situation. This way the designers do not have to haul in crazy amounts of content to keep things spicy. Even with massive resources handcrafting all content is bound to produce repetitivity (compare the repetitive maps of XCOM:EU to the randomized maps of the original X-Com). Is there a dominant strategy or tactic that works best for the player in almost all situations? If yes, then combat quickly becomes boring, dull and linear. The player just does the same in every battle, and that, for us, is the opposite of fun. This one is tricky. 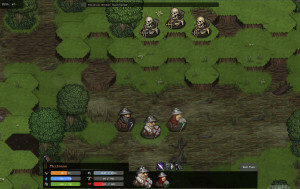 Once players start min-maxing the combat they will do everything to find dominant strategies and spread them to other players. The solution is to two-fold. First, make sure that there is a variety of viable playstyles. This has to do with thorough balancing and playtesting and is just hard work. We want to make sure that each option, each weapon and piece of armor, brings something valuable and ideally unique to the player’s tactical repertoire, and that there is no piece of equipment that is just plain worse than another one in every situation. A linear equipment progression takes away choice from the player, because the answer is always obvious – but by applying pros and cons to the equipment, we want to enable the player to find for him or herself what works best in a given situation. For example, while heavy armor offers more protection than light armor, the wielder also becomes exhausted more quickly and unable to use more specialized skills in quick succession. Both heavy and light armor are valid choices, but they require different playstyles and are suited to different situations. Secondly, put enemies in the game that counter dominant strategies so the player has to adapt (we call them “combo-breakers” internally). For example: Putting your armored and shield-bearing Battle Brothers in front and those with ranged weapons in the back, so that they are protected, is a common sense strategy that works well against basic enemies as long as you can avoid being flanked. Now imagine an enemy that exploits this exact strategy and turns it into a disadvantage for the player. A while ago we put in an enemy called “Withered Vampire” that uses his special ability “Dark Flight” to turn into a swarm of bats to basically teleport behind the front line and pick off isolated and weak targets – usually the player’s archers – one by one in close combat. The vampire, although not a weak enemy by any means, isn’t even that strong in terms of hitpoints or the amount of damage he does – a few good hits will kill him. What makes him so dangerous an opponent is by far and large that he challenges the dominant position of the frontline-backline strategy that works so well against other opponents, and that the player has to adapt tactics here or be punished. Now, imagine further that a vampire appears together with a few skeletons – again, the player has to adapt to find a strategy that counters both types of opponents at the same time as best as possible. Of course, this is just one example of how to use combo-breaker against certain strategies. This is a pretty obvious but still important one. If combat is too easy it gets boring, if it is too difficult it quickly gets frustrating. A lot of balancing is required, from beginning to the end of the development cycle, until we’ll be satisfied that the challenge and progression feels right for the player. Yet, who exactly is the player? It could be anyone from a genre novice to a hardened veteran, and that’s why we’ll go with various difficulty levels for the final game. What we won’t do is inflate enemy hitpoints or just have them inflict more damage; that, to us, feels like lazy game design that more often than not doesn’t even make the game more difficult, but only more tedious and random. Instead, we think that more interesting ways to make things challenging for the advanced players are savegame restrictions (ironman), resource limitations (less money, less gear, etc), more enemies in encounters or late game enemies appearing earlier in the game, slower healing times for wounded Brothers and so forth. Turning off permadeath in the game will not be an option for us as it is an integral part of our gamedesign. This mantra can be summed up in a simple sentence: “what makes sense in real life makes sense in the game”. Now of course, there are no undead trying to eat you alive in reality but we’re talking combat mechanics here. If you have the high ground you have an advantage, and conversely, fighting against someone on high ground gives you a disadvantage. Being on high ground also allows you to see futher (beyond obstacles that would otherwise block your view), and arrows will travel further as well if you’re shooting downhill. Trying to shoot someone in the second line will be difficult without hitting the guy standing in the first line – this can be both a handicap, if that guy happens to be one of your own, and something you can take advantage of: if you’re firing into a tight formation of enemies, chances are good you’ll hit someone. Attacking anyone from multiple sides will make it difficult for him to defend himself. All these factors and more are already in the game and we hope that eventually the player will feel intuitively how the combat works without requiring him or her to study a lengthy manual or rely on intrusive UI for every little detail. So before putting any mechanic into the combat system, we always put it to the reality test. If the player does not get it, it produces frustration and forces the player out of his way to study some information instead of playing the game. This is also a very important aspect regarding immersion. An intuitively understandable combat system greatly helps with creating a dense and believable atmosphere. Is the outcome of a combat action perfectly predictable? You can go either way on this one depending of what kind of game you are designing. The one extreme would be checkers where every action has a completely pre-determined result, without any randomness involved. The other would be a completely random diceroll that determines the outcome where you can never tell what will happen. High predictability produces more of a puzzle game where you are trying to find the optimal solution for any given situation. This allows for a lot of mathematical minded gaming, of min-maxing and number comparison which can take away from what the game actually tries to portray (pseudo-medieval combat) in favour of exposing how the simulation works internally (numbers!). This is something we aren’t entirely comfortable with. With Battle Brothers we want a bit of both worlds. A certain amount of predictability to make planning ahead viable and to reduce frustration caused by random events completely outside of the player’s control, but mixed with some randomness (dice rolls) and incomplete information (hidden numbers) to create suspense, unexpected situations, to make the player feel very subjectively that an enemy is strong against any particular strategy instead of just going “omg! it has 9000 hitpoints!”, and finally, to keep players on their toes at all times. Is the player forced to make certain decisions? How close does he have to stick to the rules? As with the last point this is a decision where there is no wrong or right. We decided to go with a more open system allowing the player to experiment with certain playstyles as he or she likes. This is why we have no rigid classes for the Battle Brothers in the game. The active skills any Brother has at his disposal are determined by equipment. This way the player is free to experiment with any combination thereof – for example, going with an all ranged squad with no melee fighters. On the flipside, this also allows for the player to fail miserably. Yet, we want that kind of freedom in our game since it is all about YOU, the player, and how your story unfolds and not about something we made up and you have to “re-enact”. We embrace that failing at this game (and learning from your mistakes) is part of the gameplay, just like succeeding is. In this way, the game runs counter to some of the more recent game design philosophies of not having the player fail and always allowing him or her to progress. We are convinced that this grade of freedom allows for awesome and unique stories and a fresh feeling everytime you start a new game even if it means that the game is less accessible to players new to the genre. In the next part of the devblog we will lay out the details of the combat system in the game so you can see how the mantras above found their way into the actual combat mechanics. In the meantime let us know what you think in the comments or head over to the forums!